The following are tips about our products too not only help you understand how to use the products, but to also save time and money. Lovely Is As Lovely Does! Facial Nutrient – Serves as a facial moisturizer, eye cream and lip balm. Start with a pea size amount for your entire face that should do it during the day. If you are very dry around the eyes and/or showing lines, add just a tiny bit more under the eyes. It’s also great for the nail cuticles, so pay attention to them just after placing your moisturizer on. Neroli Conditioning Shampoo Bar – Take care of your hair care needs while you're having a shower. This product serves as a shampoo and conditioner, leaving on while taking the time to clean your body. The longer you leave in the hair the more enhanced the conditioning properties are (less time for thin hair). Helichrysum Oil – Great for troubled acne prone skin, sore muscles, bruises, scratches, burns, cuts, razor burn, etc.., its great support for any skin issues. Dr. Oz did a show discussing the anti-inflammatory properties of this oil and how it helps with pain. Use Waterless Products – because they are undiluted, you products will last longer, resulting in less time in the stores. In addition, usually waterless organic products do not have harsh preservative, chemicals or toxins in them, so less problems with the skin, resulting in less time in the Doctors office. Many of our products are multi-funchtional so remember to click on the read more link in the shopping section to learn more about them. You'll find the description , Ingredients and How to Use Tabs. 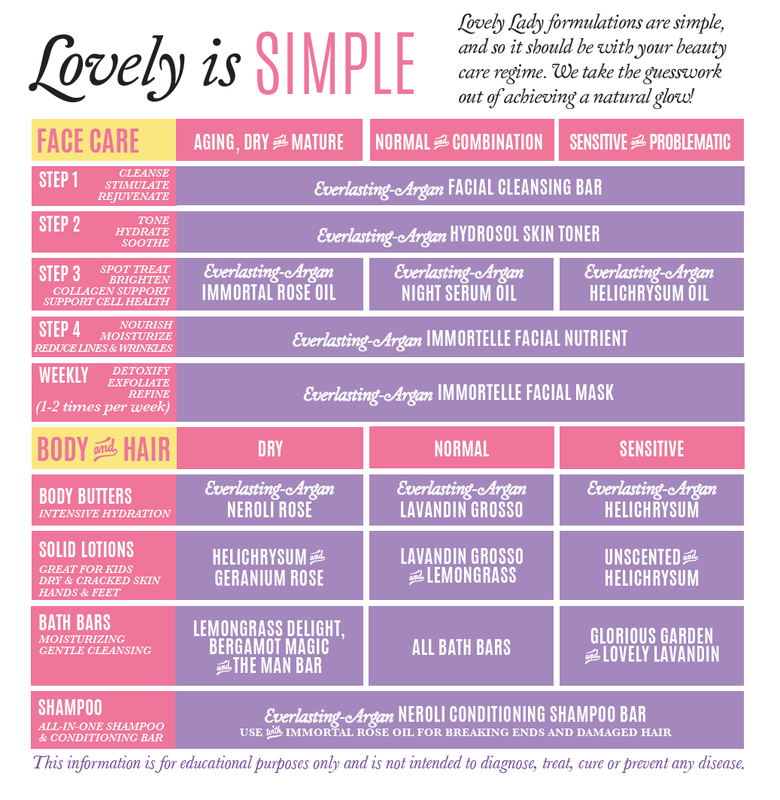 Final Tip: Finding a simple routine for maintaining good skin regardless of a busy schedule: The chart below is a simple outline to follow. You really don't need any complicated routine and if your skin requires a bit more due to the signs of aging or you want to minimize aging too quickly, be sure to do the following at night. Clean, tone and place a great night serum on your face. The body and skin restores itself during the night while you sleep. Note: Exfoliating and using a mask should not be a part of your daily or nightly routine, but you should make time for it once a week if you have dry, aging or acne prone skin. We are presently looking into reformulation for our prior mask, stay tuned for details in the future.